I love blank books. Journals, sketchbooks, guided art books, mini blank books, notebooks, composition books, I love them all. Each one I buy is a space of infinite potential. The heft and feel of the book and opening the cover for the first time is my favorite experience. I definitely have a peper fetish. I imagine myself filling the pages with thoughtful prose, charming sketches and lovely calligraphy. Or cramped paranoid diatribes and psychotic little images of my favorite suicide methods. Whichever. I open a new book, pen in hand, and…. write something insipid and whiny. No snippets of literature, no poetry, no insights. Then I put the book aside, disappointed in myself and how I wasted infinite potential. The book goes on a shelf. I will later try to revisit the journal, tearing out the offending first entry, but the book is tainted and its potential limited. 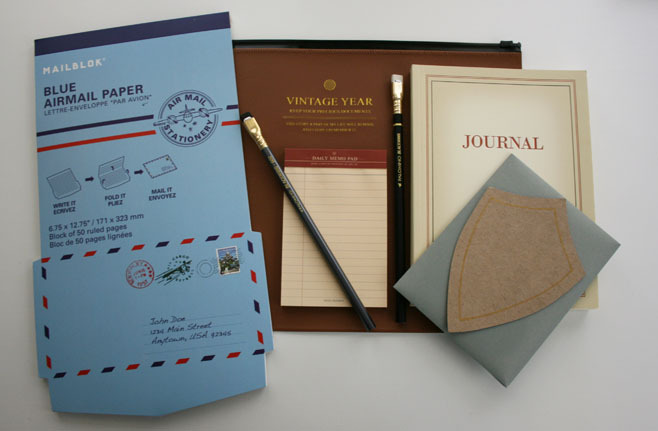 The airmail paper folds into its own envelope which will be wonderful for my thoughtful letters, as will the shield cards. The journal is lined inside and I love the french book feel it has. The cute little pad is for inspiration and the pouch will carry my brilliant manuscripts. The Blackwing pencils were gifts from Chandra who owns the place and is a wonderful lady. As addicted as I am to the internet and as a huge fan of email and texting, my real love is paper and ink. It represents a way of thinking and living that is thoughtful and wise, like those aspirational blogs written by clever women who live in spaces of grace and beauty. With each book, pen, and card I try to buy my admission to that space. ** The tactile nature of producing letters and writing in books, holding my pen or pencil always relaxes me. Deep down I suspect that while melancholia has led to great artistic works of literature and correspondence, it can just as easily make you boring. I want to learn to speak with a different voice and write with grace and beauty and the more write the closer I’ll get. I hope. *I’m working on actually doing it. **I’ve joined the Letter Writers Alliance (I’m waiting for my membership card) and am looking for new people to correspond with.